As a participant, whether new or existing, you should be in the loop. Genetic genealogy wouldn’t exist without interactions. Matches interacting with matches. Group Project Administrators interacting with their members. Participants interacting with their own results. When you look at your results, you’re not simply looking at a computer screen. You’re looking at everything that’s happened in the past one hundred thousand years, where every event had to happen exactly as it did for you to exist. It is now up to you to learn about your past and present to pave the way for your future. We hope you enjoy the new FamilyTreeDNA blog. It’s our obligation to keep everyone as up-to-date as we can on everything related to our company. Whether it’s scientific breakthroughs in our lab, new discoveries, customer stories, site upgrades, resources within our site you weren’t aware existed, or sales announcements, the floor is now open. There are so many exciting things happening just within the walls of our building, it would be unfair to not share in the growth of the company you helped to build. We are only as good as the people who test with us. 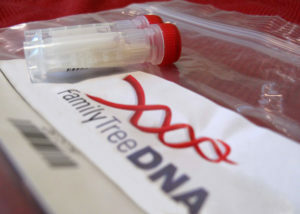 ‘FamilyTreeDNA’ does not only refer to the use of DNA to uncover family history. ‘Family’ isn’t in our name by accident. We consider ourselves a family, not only in regards to everyone working here, but as it relates to the entire community of test takers, genealogists, and to humanity in general. We treat everyone with the same standards we would give our own immediate families. We’re not just genetics. We’re not even just genetic genealogy. We are a family. We are FamilyTreeDNA. Stay tuned for regular posts and bookmark our FamilyTreeDNA blog for easy access!